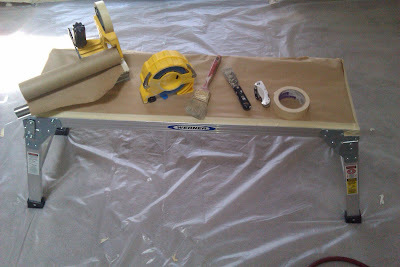 Taping Tools to Guarantee Painting Sucess! If you want to successfully tape like a pro you gotta get pro taping tools. Notice the Paper to Protect bench from oil over spray. 3M Hand Masker Tape Applicator TA20 loaded with 3M 2'' Blue Tape. Perfect for covering outlets and switches. The razor cutter on the TA20 allows you to cut a perfect perpendicular cut. Dust Brush. Any old brush will work. The bigger the better. We stopped using this size and started hauling around shop dusters in our back pockets. 1.5'' Flexible Putty Knife. Hyde makes one of the best for this because of the supper sharp corners. Folding Knife or Snap Knife. Don't ask why this is not a snap knife maybe that day needed a little extra bling or something. 1.5'' 3M Masking Tape. When loaded into the TA20 this is the perfect combination of width and work ability to protect baseboards from roller splatter.